Set of 4. Black faux leather coasters with orange ECU Tiger logo printed on the front. Solid glass shot glass with "ECU" and University's establishment date printed on the front in black. Fluted structure gives the glass nice weight and prevents it from easily tipping over. A wonderful addition to any collection! Sturdy ceramic mug with a unique shape. White body with orange interior glaze. "East Central University Grandma" printed on the front in black and orange print. A wonderful gift for any grandmother! 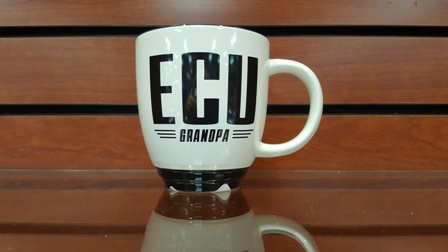 White ceramic mug with "ECU Grandpa" printed on the front in black. Mug shape and size allows it to fit comfortably in the palm of your hand. A perfect gift for any grandfather! Sturdy ceramic mug with a unique shape and orange glaze. Thick walls keep beverages warm for long periods of time. "East Central University Mom" printed on the front in black. Makes a great gift for any mother! Transparent plastic body with stainless steel bottom and cap. "ECU Tigers" printed on the front in bright orange. Light, yet durable body makes this the perfect everyday water bottle. 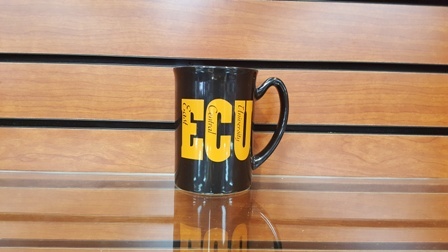 Splatter painted mug with "ECU Alumni" carved into the side. Mug size and shape allows it to fit comfortably in the palm of your hand. Splatter paint glaze. Available in orange with black and white splattering or black with white splattering. Please select option for Etched Alumni Mug. Ceramic mug with a traditional shape that fits perfectly in the palm of your hand. Black glaze with ECU logo etched into the side. Double-walled, stainless steel thermos, keeps beverages piping hot long after they've been poured. Spill resistant black plastic lid with turn closure. Extended handle allows thermos to be grabbed easily, making it a necessity for early-morning rushers. Black body with ECU logo etched in silver.